This collection of suitably named roses are perfect for Birthdays, Weddings, Anniversaries, Retirements and other special occasions, making them an ideal, long-lasting and thoughtful gift. We have also added some our highly recommended remembrance roses to this collection, which offer a thoughtful way to remember loved ones and friends who are sadly no longer with us. This very hardy rose flowers all summer long, with scented blooms on a sturdy bushy plant. Very Healthy. Bred by Noack. A lovely patio rose, with small semi-evergreen dark glossy leaves and clusters of small orange-red flowers.Repeat Flowering. Bred by Poulsen. (H.T) A lovely rose of buff apricot. Fragrant. Healthy free flowering, good for cutting, exhibition and bedding. The perfect Gift. Continuously produced, large white hybrid tea blooms with a lovely fragrance. Dark Glossy foliage. (Floribunda) Bright crimson, cupped, double flowers, in large clusters. Foliage mid-green, very healthy. Growth robust and upright. Rose of the year 2004. Small, semi-double blooms of golden-yellow borne in large trusses. Good, glossy foliage. Known for being a very healthy plant. (Floribunda) Deep golden yellow flowers. Growth is strong and healthy. BLACK FRIDAY OFFER – Get 40% off this rose BARE ROOT with code BF18. Valid until 3pm on 26th November 2018. Large clusters of double cupped golden yellow blooms. Lovely golden stamens in the centres. Dark glossy foliage, the perfect gift. Bred by Fry. Clusters of soft pink, semi-double blooms only hold a slight fragrance but are continuously produced on a healthy, bushy plant. Foliage extremely attractive and glossy. Makes a good hedge. Masses of elegant, bright, ruby-red, repeat flowering blooms. Complimented with dark green, glossy foliage. Lightly scented. An ideal rose for growing in a tub and a good varitey to cut and enjoy inside. Mottled mauve to cerise and white blooms with silvery-white reverses, borne in clusters. Dark glossy foliage. Very healthy. Bred By Fryers. (Hybrid Tea) Large, double shapely blooms of crimson to scarlet with a slight scent. (Modern Shrub) Large clusters of pretty, semi-double blush pink flowers produced continuously throughout the summer. Foliage bright green and glossy. A healthy and floriferous shrub; the perfect gift for that special occasion. Also known as 'Millie'. Beautiful medium pink, large hybrid tea flowers on a sturdy plant with a good scent. Good glossy foliage and repeats all summer. Large Cupped, globular, cerise crimson, fully double blooms. Dark green foliage, sturdy upright growth. 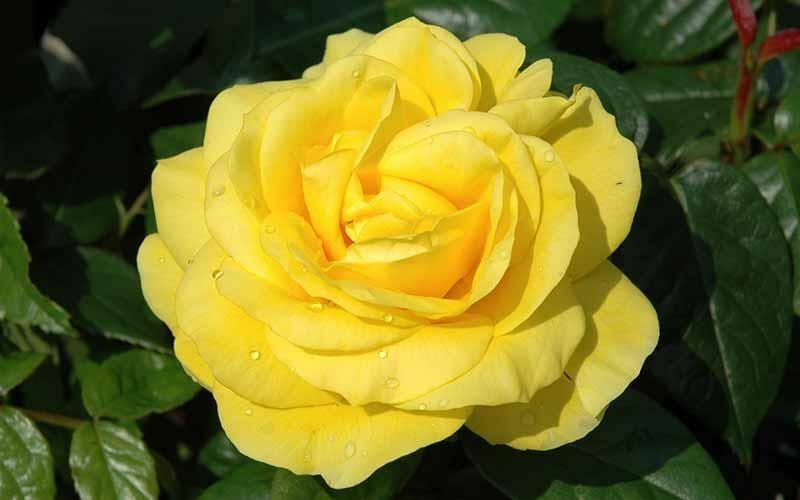 (Hybrid Tea) Deep copper blended with yellow blooms open from high pointed centres to become large, full and cupped. Dark glossy foliage, a good bedding variety. Bushy growth.